​During the Second World War the Axis powers, most prolifically the Germans, developed a vast array of armoured fighting vehicles to support their tanks and infantry. These included tank destroyers, reconnsissance vehicles, flame-thorower vehicles, and self-propelled artillery pieces. Armore tank destroyers, such as the Marder series, the Nashorn, Jagpanther, Jagtiger and the turretless Stu. III series (based on the Panzer III medium tank), helped the Nazis overcome their shortage of tanks. Copying the Stu. III series, the Italians created the turret-less Semovente da 75/18 assault gun and the Hungarians the turret-less Zrinyi. The role of self-propelled artillery the Grmans fielded - the Hummel, Wespe and the Grille, while the Brummbar and the Sturmtiger performed in the dedicated assault gun role. For armored reconnaissance, German industry came up with a series of capable armored cars, examples were the eigtht-wheeled Puma and the full-tracked Luchs reconnaissance tank. The Italians developed the impressive four-wheeled Autoblinda armored cars. Specialized anti-aircraft tanks, such as the Modelwagen, Wirbelwind and the Ostwind gave some protection against the ever more powerful Allied air forces. This fine book covers all these variants and many more besides in words and rare images and will delight readers, collectors, modelers and war-gamers. The author, Michael Green, is a much published author and collector specialising in military and naval history. His works in the popular Images of War Series include The Patton Tank (2012), Russian Armour in the Second World War (2013) and Armoured Warfare in the Vietnam War (2013). He lives in Daly City, California. Pen & Sword is located in South Yorkshire, England. This book is soft bound of 208 pages in 7 1/2" x 9 3/4" page format. The cover art shows a large color photo of a restored Stu. III Ausf. G, over small color photos of restored Sd.Kfz. 234/3 armored car, a Sd.Kfz. 10 half-track, a captured Italian Autoblinda AB43 armored car and a Pzkpfw. IV/70 (V) tank destroyer. 1. Reconnaissance Vehicles, with 42 black and white wartime photos and 14 color photos of restored vehicles. 2. 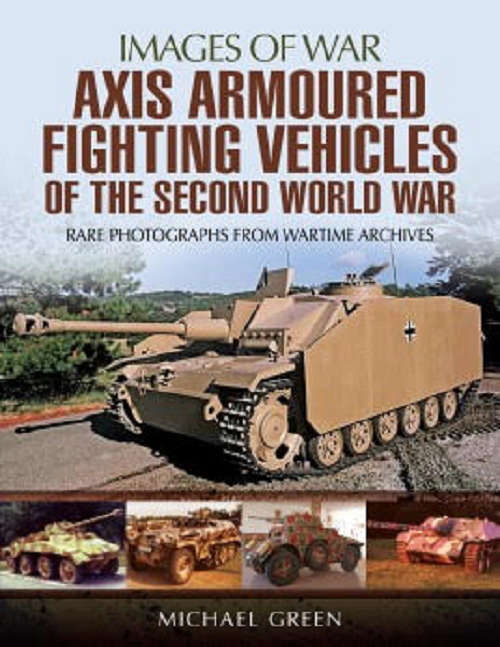 Assault guns, with 28 black and white wartime photos and 31 color photos of restored vehicles. 3. Tank Destroyers, with 22 black and white wartime photos and 46 color photos of restored vehicles. 4. Miscellaneous vehicles, with 28 black and white wartime photos and 24 color photos of restored vehicles. Unfortunately, the book does not contain photos of the Pz.Kpfw. 1, 2, 3, IV, Panther or Tiger, and this is my most gripe about the ommisssion of those. Otherwise it is a great photo album of the types included in it. I want to thank Casemate Publishing, the N. American distributor of Pen & Sword books for this review sample, and the folks at Pen & Sword too.